The following is a transcript of emails sent this morning to Dean Braun, Dean Miller, and Beth Pitts, respectively, by Organizing for Survivors (O4S), inviting them to meet in Parrish from 1-4 today. This text was also posted by O4S on their Facebook page. 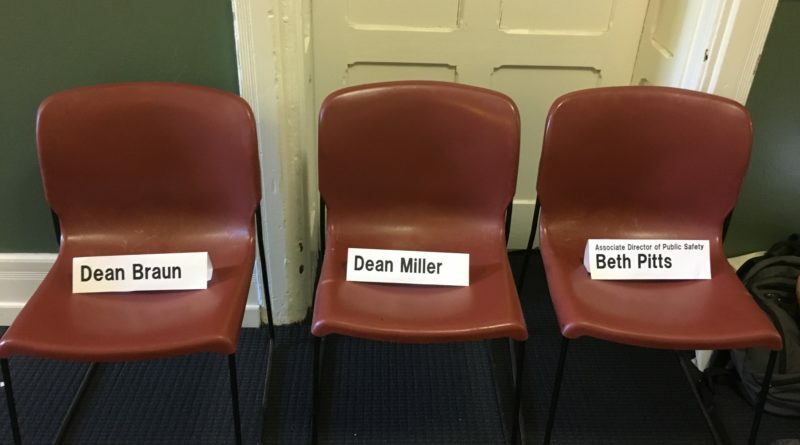 As you know, O4S has been sitting in Dean Braun’s office since Tuesday, and in Dean Miller’s office since yesterday. This sit in is a result of years of frustration. We are here because President Smith has not met our demands, and because the three of you have not met our demands for your resignations. We included your resignations on our list of demands because survivors have collectively identified patterns of harm and neglect in your behavior. You have failed to do your jobs at Swarthmore. Students have given you feedback and criticism, and opportunities to change, and you have failed to perform better. On March 23rd, we sent each of you letters explaining all of these reasons in detail. Dean Braun, when we met with you in person you refused to speak to us about students’ demand for your resignation. You have not spoken to the campus about the harm you have caused students. You have had six weeks to respond, to engage, to apologize. You have not even attempted to do these things. When we have seen you, Dean Braun this week, you have refused to acknowledge us or answer our questions. Today we are reaching out to you, to give you an opportunity to make amends for your silence this week, and come to speak to the hundreds of students who have been sitting in. We wish to invite you to have a conversation with us about our concerns and any questions you might have for us. We invite you to join us today any time between 1pm and 4pm outside of Dean Braun’s office for a conversation with the community. We hope you will take this opportunity to give students the engagement they deserve from you. Please let us know if and when we can expect you here, so we can invite those who would like to speak to you. We included your resignation on our list of demands because survivors have collectively identified patterns of harm and neglect in your behavior. You have failed to do your job at Swarthmore. Students have given you feedback and criticism, and opportunities to change, and you have failed to perform better. On March 23rd, we sent you a letter explaining all of these reasons in detail. Dean Miller, you have not responded, publicly or privately, to students’ demand for your resignations. You have not once reached out to O4S, or spoken to the campus about the harm you have caused students. You have had six weeks to respond, to engage, to apologize. You have not even attempted to do these things. 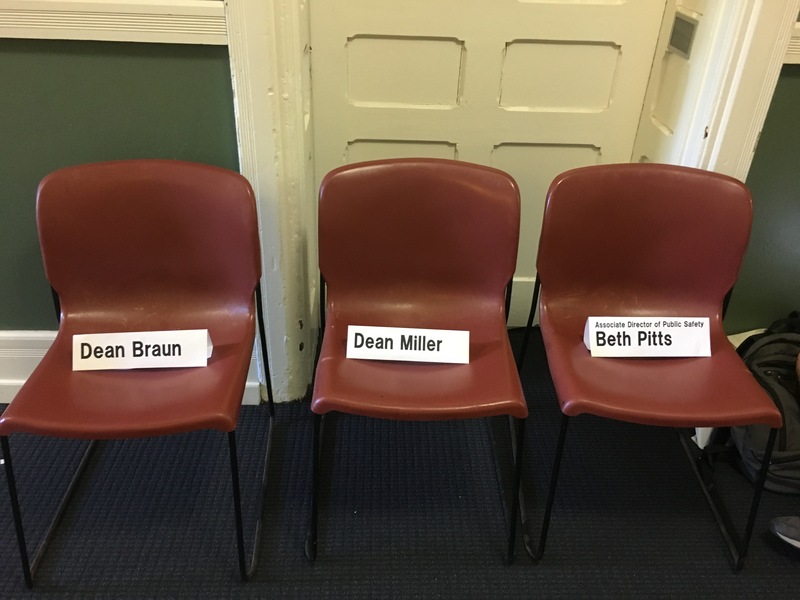 When we have seen you, Dean Braun and Dean Miller, this week, you have refused to acknowledge us or answer our questions. Today we are reaching out to you, to give you an opportunity to make amends for your silence this week, and come to speak to the hundreds of students who have been sitting in. Beth Pitts, you have not responded, publicly or privately, to students’ demand for your resignations. You have not once reached out to O4S, or spoken to the campus about the harm you have caused students.